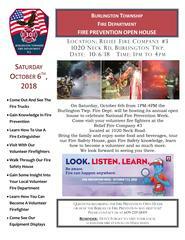 Burlington Township Fire Department hosts its 2018 Fire Prevention Open House on October 6th. On Saturday, October 6th from 1PM-4PM the Burlington Twp. Fire Dept. will be hosting its annual open house to celebrate National Fire Prevention Week. located at 1020 Neck Road. Bring the family and enjoy some food and beverages, tour our Fire Safety House, gain Fire Safety knowledge, learn how to become a volunteer, and so much more.